Observation Island (EAG-154) was laid down as a Mariner Class high speed cargo ship 15 September 1952 by the New York Shipbuilding Corp., Camden, N.J.; launched as Empire State Mariner 15 August 1953; sponsored by Mrs. Samuel C. Waugh; and delivered to the Maritime Administration and the United States Lines for operation under General Agency Agreement 24 February 1954. Empire State Mariner, Capt. V. R. Arkin, Master, made three voyages for MSTS. The first two took her to Bremerhaven and Liverpool. The third, commencing in May 1954, took her along both the east and west coasts, as well as to the Canal Zone, Guam, Korea, and Japan. She returned to Mobile, Ala. in September 1954, and entered the National Defense Reserve Fleet 9 November. 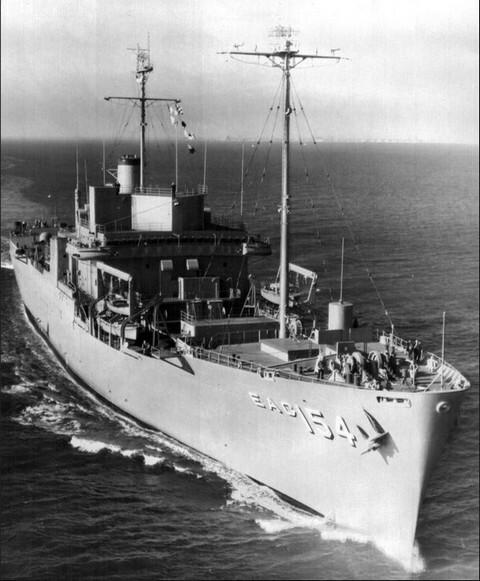 Empire State Mariner transferred to the Navy 10 September 1956 with three other Mariners. Her conversion to the first naval ship having a fully integrated Fleet Ballistic Missile System was authorized 15 October 1957, and partial completion of the project was accomplished at Norfolk Naval Shipyard, Portsmouth, Va. before she commissioned 5 December 1958 as Observation Island (EAG-154), Captain Leslie M. Slack, USN, in command. During the conversion there were no major hull or engineering changes made other than installation of a roll stabilization system. However, extensive alterations were accomplished in the superstructure and hold areas so as to accomodate the FBM Weapons System. Observation Island departed her homeport of Norfolk 3 January 1959, underwent shakedown at Guantanamo Bay, and then operated on the Atlantic Missile Range off Cape Kennedy, conducting dummy missile launches and communications tests. In March 1959 Observation Island returned to Norfolk Naval Shipyard for installation of additional equipment, including the Ships Inertial Navigation System (SINS). In June she steamed for her new homeport, Port Canaveral, Fla., and made preparations for the first at-sea launch of a Polaris missile. Designated UGM-27, the missile was successfully launched from Observation Island 27 August. Following this milestone, Observation Island returned to Norfolk Naval Shipyard for installation of a fire control system to enable her to launch more sophisticated guided versions of new generation Polaris missiles. She also received a new launcher, the developmental prototype of those installed in the FBM submarines. This work was completed in January 1960 and Observation Island returned to Port Canaveral to continue Polaris test launch operations. After a total of six launchings, the ship commenced support of Polaris launchings from FBM submarines. She provided optical and electronic data gathering services, and acted as communications relay station between submerged submarines and the supervisor of range operations at the Cape. The first successful fully guided Polaris missile launching from a submerged submarine took place 20 July 1960 from George Washington (SSBN-598). Through October Observation Island also supported launches from Patrick Henry (SSBN-599). Following further modifications at Norfolk Naval Shipyard in the fall of 1960, Observation Island returned to Port Canaveral in December to continue FBM support work and systems test and evaluation. She received the Navy Unit Commendation 15 December; launched the new A-2 Polaris 1 March 1961; and supported the first submerged A-2 launch from Ethan A lien (SSBN-608) 23 October. In late 1961 Obervation Island served as a survey ship on the Atlantic Missile Range, and in January 1962 she again put in at Norfolk Naval Shipyard, this time for modifications preparatory to launching the new A 3 Polaris. Returning to Port Canaveral in March, she supported FBM submarines through the following autumn, when she steamed for two months of operations on the Pacific Missile Range. Observation Island was back at Port Canaveral by Christmas, and until June 1963 she expanded her role of oceanographic survey in the Atlantic Range. She conducted the first successful at-sea launches of the A-3 Polaris 17 and 21 June. President John F. Kennedy came on board 16 November to observe a Polaris launch. She has since continued to operate essentially as a sea-going platform from which missile launches can closely approximate conditions encountered in FBM submarine launches. Her equipment is constantly being modified, allowing prototypes to be tested thoroughly before missiles and associated components become operational with the Fleet. As a mobile platform, she can conduct tests in any instumented range. Observation Island was redesignated AG-154 on 1 April 1968. She commenced an extensive ten month conversion 24 June at Norfolk Naval Shipyard in preparation for support of the Poseidon C-3 missile program. The summer of 1969 found her once again at Port Canaveral, ready to resume experimental missile launchings, to assist in the training of FBM submarine crews, to assist in FBM submarine shakedown operations at Cape Kennedy, and to support other important phases of the development and deployment of FBM Weapons System. She continues this significant work in 1970.